As the proud owner of a dog-eared version of Henry Chesbrough’s classic book, Open Innovation, I was anxious to devour his latest work, Open Services Innovation. Chesbrough, a business professor at UC Berkeley, spearheads this movement through the Center for Open Innovation. 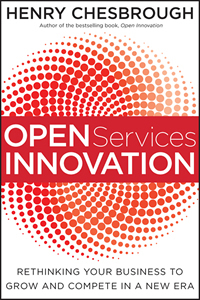 Open Services Innovation provides an integrated approach and framework that explains so much of what’s happening today. Chesbrough clearly demonstrates through real-world case studies that services are not just an after-the-sale bolt-on item anymore. Services are transforming industries by reframing the competitive playing field in historically product-driven markets. I had an opportunity to catch up with Henry to learn more about his latest work. 1) Why did you decide to write a book about services and open innovation? I was prompted to write about open innovation in services by two factors: first, that much of the economic activity in the top 40 economies in the world is based on services, not products and technology; and second, that many leading innovative companies are finding that their own businesses are shifting towards services as well. I also concluded that we know a great deal more about innovation in products and technologies than we do in services. Hence, this book. 2) How does open innovation differ between services and products? There are a few differences. One is that services are intangible, making them hard to manage the same way as products. Most companies in services don’t have the equivalent of an R&D funnel of projects flowing from the lab to the market. Indeed, most do not have an R&D department at all. A second difference is the role of the customer. While companies carefully research customer interests prior to embarking on product development, the customer sits largely outside the process. In services, the customer must be intimately involved in the innovation process from inception through to the market. 3) Where is the customer in the services value chain vs. the product value chain? In Michael Porter’s famous value chain from his 1985 book, Competitive Advantage, the customer sits at the very end of the value chain. The competitive advantage that arises from his value chain comes from products of higher quality, lower cost, or unique differentiation. In the services value chain, the customer engages with multiple parts of the value chain throughout the process, not just at the end of the chain. 4) Why is customer co-creation important? Because services are fundamentally intangible, it is tricky to specify services in advance. Often we cannot tell what we want until we see it. This involves tacit knowledge, which is created from experience. Co-creation is a process that invites the customer to be part of a creation process, precisely to unlock that tacit knowledge of what the customer really wants. Often the customer is not able to articulate their real needs without interacting in the process along the way. 5) IBM is a great example of a company that made a transition from a product focus to services focus. Should all companies transition to services? If not, what are the indications that a transition to services should be pursued? A key motivation for companies to undertake open innovation in services is to escape the commodity trap. This is a situation where working on making products faster, cheaper, higher quality, etc. no longer brings much if any profit. The spread of TQM and Six Sigma, the globalization of manufacturing and now R&D, the rise of the emerging economies, all these forces make it harder and harder to sustain differentiation in a product business. Services are an effective escape route to the commodity trap, and openness is an effective way to attain both economies of scale and scope along the way. Companies that are happy with a commodity business (think of companies selling raw materials like mining, metals, and petroleum) need not bother with open services innovation. By contrast, companies that are finding their margins shrinking over time, despite their continued investments in R&D and innovation, should actively consider adopting an open services innovation approach. 6) What are the keys to transitioning effectively? One key is to nurture senior managers from the services side of the business. I used to manage a services function in a disk drive company (a subsidiary of Quantum), but we were managed as a cost center. Our primary task was to keep the product from coming back from the customer. It was unlikely for someone from our services organization to rise very high within our company at that time. Another key is to put price tags on the services offered by the company to the customer. Many product companies bundle services in for free with the product. The accounting systems of such companies show that services are unprofitable. But that is an artifact of the pricing model of the company, not the underlying economics of services. A third key is to open up innovation processes to the customer, to invite the customer into the process earlier on, and to engage more intensively with them. A final key is to change the business model to embrace a model with lower initial prices, perhaps lower gross margins, but greater ongoing revenues. This will involve tracking metrics like customer acquisition cost, customer retention rates, and lifetime value of the customer, instead of gross margins (which are typical measures for product companies). Takeaway: True to Chesbrough’s style, this book delivers with a model on the open services value chain that turns the classic product-oriented value chain on its ear. It demonstrates that customer and partner collaboration is pervasive throughout the development and delivery process and includes customer co-creation as a key element. All of these factors provide ways to apply a services mindset to differentiate the offering and alter the competitive playing field. For anyone involved with product or service innovation, this book should not be missed. Adrian Ott is the award-winning author of The 24-Hour Customer: New Rules for Winning in a Time-Starved, Always-Connected Economy which was named a Best Business Book 2010 by Library Journal and by Small Business Trends. Join us on Facebook to win an iPad 2 or a free copy. Follow Adrian on Twitter at @ExponentialEdge.